The RRTTC decided to undertake a new project in the summer of 2012: creating a community garden and providing educational teaching lessons for any and all who may use the space. The wooded area behind the Center for Energy and Environmental Education building on UNI's campus, serves as the garden's home. 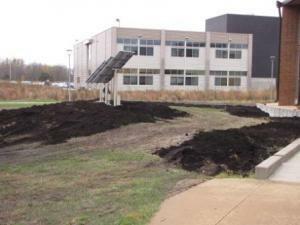 Most recently, soil samples were submitted and the RRTTC broke ground on the new site. 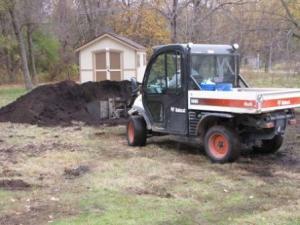 During the fall months, garden lime fertilizer has been applied and the soil has been tilled. Look to this site to get updates about the garden and learn about the educational lessons that will be provided in the future. 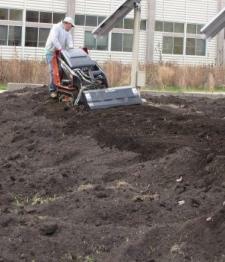 In Fall 2012, the garden entered the second stage of its development: tilling. 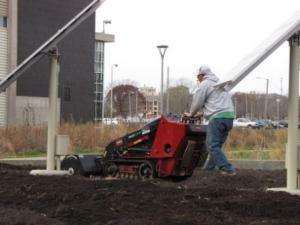 Tilling involves turning over the soil in the garden for several reasons: it aerates the soil before planting and aids in mixing additives like fertilizers and composts into the soil. If there are early weeds in the garden, tilling removes them from the soil, leading to less competition for plants that are to come later.